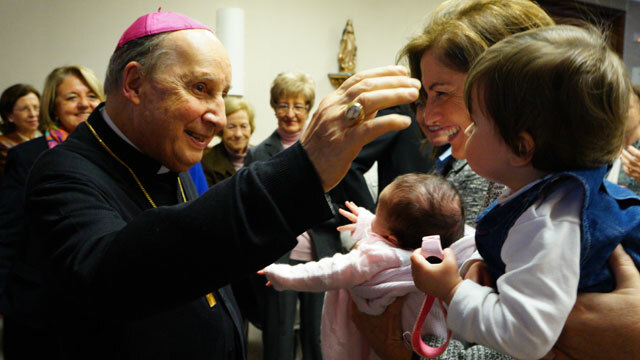 At 9:08 pm on December 12, feast of Our Lady of Guadalupe, Bishop Javier Echevarría passed away at the age of 84. As Prelate of Opus Dei, he was the second successor to St. Josemaría Escrivá. He died comforted by the last sacraments, administered to him by the Auxiliary Vicar of the Prelature, Msgr. Fernando Ocáriz, a few hours before his death. Bishop Echevarría had been hospitalized on Monday, December 5, at the Campus Bio-Medico University Hospital in Rome with a lung infection, and was receiving antibiotics to combat it. In the last hours of Monday, December 12, complications arose that caused difficulty in his breathing and ultimately led to his death. In the early hours of the night the hospital chapel was set up for the wake, and throughout the night Requiem Masses were celebrated there corpore insepulto. On Tuesday, February 13, the body of Bishop Echevarría was transferred to the Prelatic Church of Our Lady of Peace. Many people came to pray for his soul and to say their last farewells. The Auxiliary Vicar mentioned that on the past December 3rd, his saint’s day, Bishop Echevarría told the people of Opus Dei who were with him: “I want to lean on your support. I need you. I’m finishing my stay with you. The Prelature of Opus Dei is in your hands. Support the Prelate, whoever he may be.” Msgr. Ocáriz also said that in his final moments, the Prelate “prayed to our Lady of Guadalupe” for the fidelity of everyone. Romana, No. 63, July-December 2016, p. 226-227.